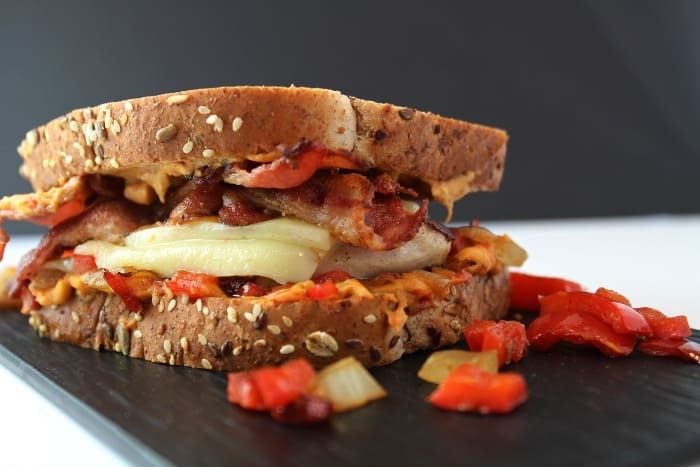 The flavors of this rustic chicken and bacon sandwich built between 2 slices of Country Harvest Canadian Rustic Bean Bread smothered with roasted red pepper hummus, sautéed onions and monterey jack cheese make this the ultimate sandwich. Just look at all those layers in this hearty, warm, mouth-watering sandwich, the perfect sandwich for a cold Fall day. I had the opportunity to try the new Country Harvest Canadian Rustic Bean Bread for this recipe and I was delightfully happy with the taste of it. I honestly wondered what the texture of the bread would be like since it is packed full of pulses including chickpeas, beans, lentils and peas, and the texture did not disappoint. Each slice of this bread provides 6g of protein, 3g of fibre and 22g of whole grains. Country Harvest is an innovative leader in quality grain products – they have been for over 40 years, so it is not surprising that it is the first national brand to market a PULSE grain bread product. This was the perfect bread to use for this rustic chicken and bacon sandwich. Hearty, rustic, delicious! For this sandwich you will need, 2 slices of Country Harvest Canadian Rustic Bean bread, 1/2 of a grilled chicken breast, 2 tbsp roasted red pepper hummus, 1/4 cup sautéed onions, 1/4 cup sautéed chopped red pepper, 3 slices of bacon (cooked), and 3-4 slices monterey jack cheese. Just take a look at this flavorful, delicious sandwich. The Country Harvest Canadian Rustic Bean bread is the star of the show because it is proudly made with pulses that are 100% Canadian and are sourced from Western Canada! Spread the roasted red pepper hummus on 2 slices of .Country Harvest Canadian Rustic Bean bread. Put the sautéed onions and peppers on top of the hummus on 1 slice of bread. Add cheese and bacon and finally, the top slice of bread. The cheese will slightly melt between the layer of chicken bacon making it extra gooey and delicious. One lucky Canadian Mommy Moment reader will win a $75 Loblaws gift card. With the launch of the new Canadian Rustic Bean Bread from Country Harvest, Canadians can confidently indulge in bread knowing that it contributes to good health, nutrition and environmental sustainability—all while enjoying a flavorful meal! Thank-you Country Harvest for partnering together with us to bring this recipe and giveaway to our readers. Mmm, I would actually go for your sandwich minus the peppers. It just has everything I love in a sandwich. I would absolutely love a delicious turkey sandwich! My ultimate sandwich I’d make first would be BBQ pulled pork grilled cheese! I would make a classic grilled cheese! I would make a smoked meat sandwich with the bread. I would have a chicken breast with tomatoes and cheese. That bacon looks sooo…good. :). I’d make a turkey sandwich! I would most definitely make your Rustic Chicken and Bacon sandwich. Sounds sooooo good!!! I pinned it. Thanks so much the recipe. I think an egg salad with arugula would be what I would make first! Thanks for the chance! I would make a tuna melt on this Rustic bean bread. 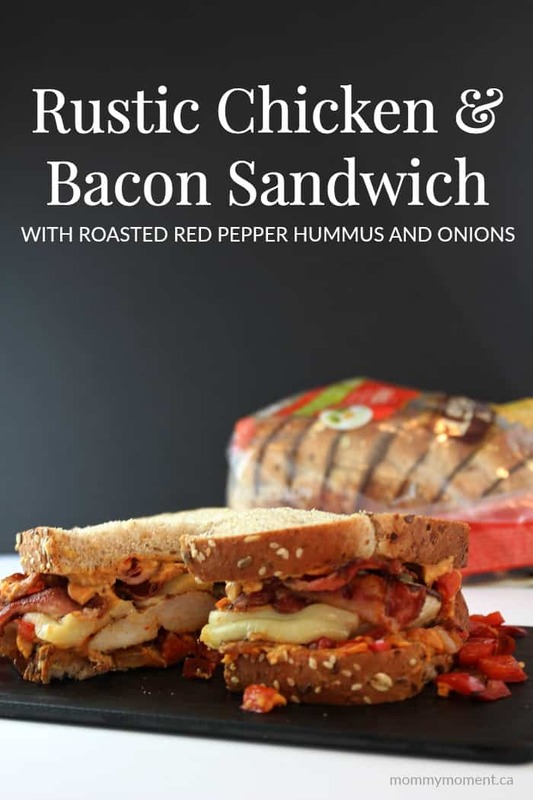 WOW, your RUSTIC CHICKEN AND BACON SANDWICH WITH ROASTED RED PEPPER HUMMUS AND ONIONS sounds like perfection to me, I would definitely love to try it first using the Country Harvest Canadian Rustic Bean bread. I would definitely make a tuna melt sandwich. I would make a BLT on my Country Harvest Canadian Rustic Bean bread? I would toast it then add fried mushrooms, bell peppers and onions on it. I think I’d use some Country Harvest Canadian Rustic Bean bread to make a classic BLT. I love A good grilled cheese with real cheddar. I’d make a club sandwich! The first sandwich I would make using the Country Harvest Canadian Rustic Bean bread is my most favorite, toasted bacon and tomato. I would make a toasted western with the Country Harvest Canadian Rustic Bean bread. I would make a chicken salad sandwich using the Country Harvest Canadian Rustic Bean bread. I am thinking I would make a ham and cheese sandwich, topped with lettuce and tomatoes. I’d make a Bacon and Peanut Butter Sandwich first! I would make a ham and swiss for sure! I’d make a sliced chicken breast with lettuce, mayo and tomato sandwich. I would love to make a BLT for my kids as it’s their favorite! I would make a BLT with the rustic bean bread. My ultimate sandwich I would make is Ham with Swiss Cheese mayo and fresh lettuce. I would first make a western with cheese. I would make a grilled cheese sandwich with the Canadian Rustic Bean bread. I would.make a tuna melt! I would probably make a turkey club, those are my favourite!! I would make a turkey club. Thanks for the chance. I would make my all time favorite..a toasted BLT with lots of mayo ! Having never tried Country Harvest Canadian Rustic Bean bread I think I’d keep it simple and make a toasted tomato sandwich as to not hide the bread with a lot of competing flavours. I picture a chicken and brie on this Country Harvest Canadian Rustic Bean bread. I would make a turkey and dressing sandwich. I would make a turkey sandwich with some cranberry jelly! I would make a smoked turkey with havarti. 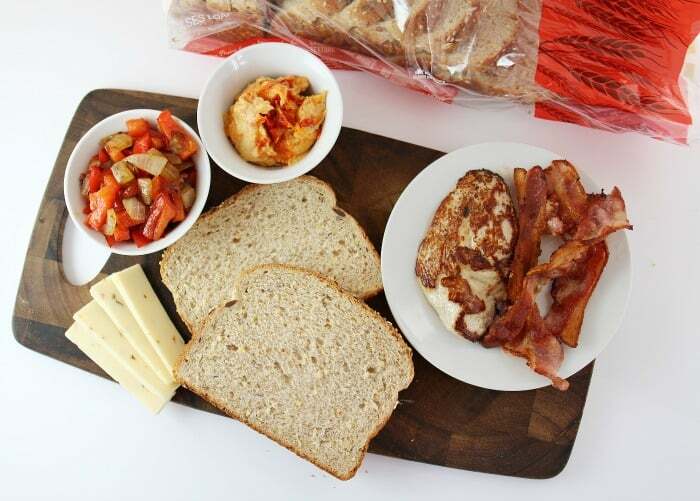 There are so many things to put on a sandwich using Country Harvest Canadian Rustic Bean bread! My favorite would be filled with salami and kalbosa sliced very thin, some aged provolone, tomato, lettuce, red onion and a mixture of mustard, mayo and a hint of Italian dressing then spread on the bread. Build it, taste it, amazing and a perfect match with Country Harvest Canadian Rustic Bean Bread! My favourite sandwich is turkey with tomato and avocado. I would make a blt! I would make the CHICKEN AND BACON SANDWICH. I would make a bacon, lettuce and tomato triple-decker sandwich! I am seeing a roast turkey with avocado and tomato with lettuce on that tasty bread! I would make a BLT sandwich but also add a few slices of turkey and Havarti cheese! I would make a ham and havarti cheese sandwich. I’ll make grilled cheese with hot peppers and Country Harvest. I would make a turkey and cheese sandwich! I would make a Bacon, Lettuce and tomato.. I would even try a Grill Cheese with Ham! The first sandwiches I would make on this bread are a BLT for me and egg salad for my daughters. oh,I would make a BLT,yummy! Turkey or chicken with lettuce. I would make a chicken breast sandwich with light mayo. I’d make a turkey and havarti with lettuce and honey mustard. Almost forgot the bacon! I’d try the CHICKEN AND BACON SANDWICH. Grilled cheese all the way!! I’d probably go with grilled cheese. I would make a roast beef sandwich first! I’ve been looking for this bread, but haven’t had any luck finding it near me yet. I love a toasted tuna sandwich with honey mustard. Could eat these everyday. I would make a chicken breast and brie sandwich! I’d make a pastrami sandwich with this bread. Yum! I’d make myself a nice toasted club .. with cheese and tons of mayo! I’d make a turkey and brie sandwich! i would make my favourite grilled cheese..bacon, cheeses and tomatoes! Yummy! Country Harvest bread is delicious to begin with. I think would make a turkey or chicken club sandwich. Toasted tuna with avocado – yum! I’d make a BLT with cheddar cheese…always a hit! I would do our favourite tuna and onion sandwich. I would like to make your recipe. The first sandwich I would make would be a chicken, bacon and ranch wich spinach. I would like to make a grilled cheese with different types of cheese! I would make a subway club with the new bread. 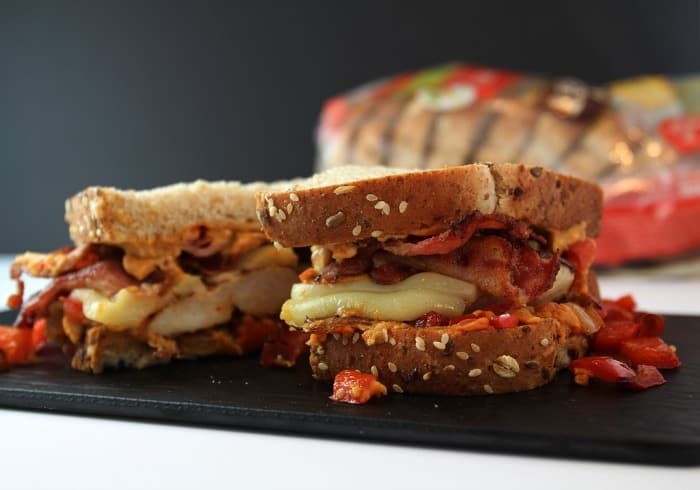 I must say I can’t get past your chicken and bacon sandwich recipe….I’m hungry and it looks so tasty! Tuna!! It’s my favorite and i would like to see how it combines with this bread. I would make a bacon and brie cheese sandwich. I’d make a chicken salad sandwich first. I would make an egg salad sandwich with pickles! I would make a salmon salad sandwich. I would make a montreal smoked meat sandwich! yum! I’d make a roast beef sandwich using the Country Harvest Canadian Rustic Bean bread. 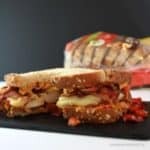 RUSTIC CHICKEN AND BACON SANDWICH WITH ROASTED RED PEPPER HUMMUS AND ONIONS looks apsolutly amazing and mouth watering! I would make it first! Grilled Artisan chicken would be really good. I love chicken sandwiches with some spinach and avocado. I would make a turkey and avocado sandwich first! I would make a cream cheese and tomato sandwich! I’d first make a ham and swiss sandwich. I’d make a veal sandwich! I would make a bacon,lettuce and tomato sandwich with mayo and salt& pepper. I would make a turkey club sandwich. I think I would make an egg salad sandwich. I’d make my favourite hummus sandwich -bread, hummus, sliced red peppers (raw), radicchio leaves, and some sweet Thai chili sauce. It’s totally yummy. I’d probably make a tuna and lettuce sandwich. I’d make a Western sandwich with Monterey jack! A classic grilled cheese sandwich for me! oh this sounds delish! I would first make a turkey and cranberry sandwich on this delicious bread! It would be terrific to win a $75 Loblaws Gift Card. the Country Harvest Canadian Rustic Bean bread? I would make a Ham,Lettuce and Cheddar Cheese Sandwich. I would make a ham and cheese sandwich! A BLT is my all time favourite sammich! I’d try a nice BLT! I think it’d go really nice with that bread. I’d make a Turkey & Swiss sandwich! Ham and Cheese – thanks. I would make a chicken sandwich first. I would make a grilled cheese sandwich! I would definitely make a club sandwich! Country Harvest Canadian Rustic Bean Bread . I would first try a Ham sandwich. Turkey & bacon sandwich for me!! I would put 6 slices turkey 3 slices provolone,tomatoes. and pesto then toast. My family would love a chicken and bacon sandwich, and I’d add some classic add-ons like lettuce, cheese, and tomatoes too! I would make a nice ham sandwich! I would make a toasted BLT!!! I would make a corned beef with pickles and mustard! Country Harvest Canadian Rustic Bean bread Grilled turkey breast, Grilled eggplant and redpepper with havarti cheese..So delicious!! I really like the sound of the chicken and bacon sandwich with roasted red pepper hummus and onions. This recipe is definitely right up my alley! Toasted lettuce and tomatoes ! I would make turkey and bacon sandwich. I would make myself a club sandwich first. I just ate but seeing that sandwich makes me want another meal! I would make a grilled ham and cheese ! I would make my favorite sandwich: Chicken with some cranberry sauce. I just love this sandwich and with this Rustic Country bread, it should be eztra cranberry sauce. Ham and cheese with mustard! I would most likely make a ham and Swiss sandwich! grilled cheese would be a great way to check out the bread. it sounds pretty good to me!! I would make a grilled ham and cheese with cheddar and pepper jack. The chicken sandwich sounds wonderful I am tempted to make that one now lol! I’d probably make a corned beef sandwich. I’m a sucker for a good corned beef. Going to look for this bread the next time I’m out is sounds yummy! I would try a peanut butter sandwich first just to see if it was just as good as my regular bread. I vote for a toasted fried egg sandwich. I would make a clubhouse. Turkey, lettuce, tomato bacon and cheese. I would make a roasted chicken sandwich with mustard, argula, tomatoes and a slice of cheddar. Ham and Swiss cheese ! I’d make a prosciutto & smoked gouda sandwich! I’d make a salami, spicy havarti, lettuce, tomato and dijon mustard. I love a turkey and Swiss sandwich on a hearty bread like this one. Turkey and swiss cheese of course! Easy — egg salad as it would be amazing! I would make a blt sandwich.